According to a research article which was published on Statista in 2018, approximately 61% of the population situated globally have agreed to access the internet. Also, another research article on Statista reads that there approximately 2.8 million mobile apps available on Google Play Store for its users. This also leads to the conclusion that approximately 2.8 million users hire mobile development services for their work. Whether it is Google, Alexa or Siri, they are all assistants developed by Android, IOS, Google, or other sources. All of these aim to simplify human tasks like playing songs or searching for information, just through a simple voice command. 1. Say hello with Google Allo! This specific mobile application for Android enables messaging facility for all its users across the globe. Just as the name suggests, saying hello to your dear ones becomes easy with this particular application based out of artificial intelligence. This robust application helps in editing photos and sending it across through its unique messenger or chat service. This artificial intelligence app also supports the use of other related Google assistant tools such as Maps for getting information for the nearby restaurant, mall, or movie theatre so that school reunions can get a lot easier. This application is used lesser than applications like WhatsApp and Messenger though. This is a speech assistant mainly for enabling its users to fluently speak in English. This particular mobile application is Android based and is available on the Google PlayStore for its users. Such language assistants become quite handy for speaking the language in a very comfortable and seamless manner for its users. This particular mobile application is also used for teaching English speaking at various schools. This version is mainly designed for laptops or desktops which support Windows software. It appears as a circular option on the Windows toolbar placed on the bottom of the screen. This version of Cortana is AI for android. It facilitates its user with a personal assistant linked through a female voice, which shall help in completing each task using the data saved on the laptop or personal computer, such tasks may include getting the work done on time whether it is a meeting or driving through heavy traffic. This is available on Google Play for its users. This version of Cortana is mainly compatible for iPhone and iPad developed byApple. Similar to its Android version, Cortana provides IOS users with personal assistance for maintaining task lists, messaging, as well as tuning into podcasts on iCloud. This application is available on Apple Store for its users. This is the artificial intelligence app iPhone supports. This is an artificial intelligence based voice assistant which mostly is used as a popular car accessory. It helps people tune into their favorite music from either their playlist or the radio supported by their vehicles. This artificial intelligence based application has been developed by Audioburst and is available on Google Play for its users to experience its unique features. This is an application which shall help students solve their homework with the help of a snap or image of the homework. According to their blog, they have won the award for Artificial Intelligence in the education genre by CognitionX. This application is supported by Apple, Google, and Time and the application developers are based out of New York City. The unique selling proposition of this particular application is that it helps in tracking parcels from couriers who are shipped to a home or office address. This app also uses artificial intelligence for reading emails and track the boarding and arrival timings of flights as well as travel itinerary. This is also an award-winning app which is mostly used by IOS users. This app was earlier known as EasilyDo Smart Assistant. This particular app uses artificial intelligence to edit images in such a way that they look real. A sad or straight face can actually look smiling through this Russian developed imaging app. The app developers are known as the Wireless Lab which has developed this application to run on Android as well as IOS. Thus, making this application categorized as an Android AI. This particular keyboard application uses artificial intelligence in learning the writing styles of its users and helping them write faster for messaging, posting on social media, as well as drafting emails. The SwiftKey Keyboard is available for Android as well as IOS users. With the growing depression rates among the global population, this app acts as a blessing when a certain user feels to share their feelings or talk to someone. This app runs on IOS and Android to cater to all sets of clients when they have the urge to talk to someone. Replika has its software and application developers being based in Brazil. This particular app is a voice assistant and the artificial intelligence has been applied to such an extent that Hound answers back the solution in the voice of its user. Hound has been developed by SoundHound Inc. The software developers for such a unique mobile application cater to every possible task available on the phone. Hound is similar to Google, Alexa, and Siri. This application is also known as one of the best AI for Android. IRIS or IRIS.AI is an application which enables in research of documents in just the time of two days. This app is mainly developed for universities to help their students complete their thesis on time. This application is robust in such a manner that it runs specifically on university software and is customized according to the needs of their students. This particular application helps in collating data and research literature required for presentation assignments of students through the use of artificial intelligence. This particular application helps in tracking the emotions of its users. This is yet another initiative to help people feel better and express their feelings on an artificial intelligence based software interface. This particular application like its name means, ‘You should feel super!’ This application can run on Android as well as IOS catering to all users requiring emotional help. This particular artificial intelligence based application which also acts as a friend or assistant even at the wee hours of four in the morning. Whether it is a fight with a friend, a bad day at work, or a break-up, this application makes a user feel emotionally better with the use of its unique life coach feature. This application can run on both Android as well as IOS platforms. This is yet another application in the virtual or personal assistant genre. Lyra’s unique selling proposition is that it can also play songs by just calling out the artist’s name through a voice command. There is also a special task of initiating jokes with the help of this virtual assistant. Lyra can run on both Android and IOS operating systems. This particular application does sound like a robot but does not act similar to it. There is involvement of artificial intelligence for making this application work. It is a virtual robot which aims to cater to users of Windows, Android, and IOS. The look of the application makes it feel like a data matrix builds out of binary digits and gaming characters which assist in tasks like predicting your horoscope and many such features. This particular app is also known as Tetra Aquatics which enables to set up and maintain a fish pond or aquarium through a virtually designed interface. There is an option for testing the water of the pond digitally and also alert features for filtering it. Olivia is yet another virtual assistant which helps in maintaining records for savings and expenses by linking all the information of bank accounts. This is achieved through the help of artificial intelligence. This application is currently restricted to the users of IOS only. Just like its name, this particular app concentrates on providing astrological forecasts and horoscope insights for its users through the use of artificial intelligence. This application can be run on Android and IOS. This application is developed for the Australian government for users to easily collate data from various sources like images, books, archives, music, historical journals, and others. Thus, making it look like a national library. This web-based application makes the use of artificial intelligence for providing relevant information. 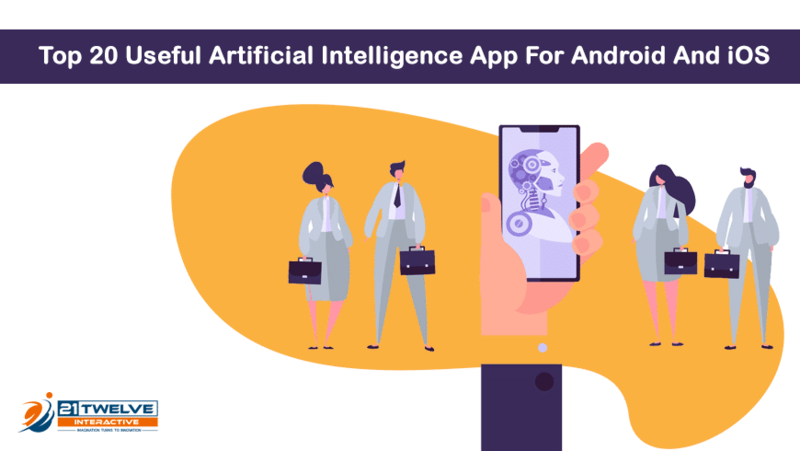 This particular app helps in savings and curbing unwanted expenses through the use of artificial intelligence. All the bank accounts are linked to this particular application and the transactions are tracked very carefully. This application can run on both the platforms namely, Android and IOS. This app was the nominee for the Webby Awards in the finance genre. These are some of the intelligence apps which, help in making tasks easier for their specific users, whether on Android or IOS platforms. The similar is the usage for platforms like Microsoft and Google. Plus, in the fast-paced lives of today, all our needs and tasks get fulfilled only through a click or simulation provided by a particular mobile app. All these factors also derive the conclusion that Artificial Intelligence has changed the lives completely making users app-dependent. However, there are some other applications which prove as lifesavers by talking or responding back to help users get out of their loneliness and boredom. This also helps them from getting depressive thoughts and sorrow and clear their minds with the help of a mobile application. Artificial Intelligence is not only limited to domestic or normal use, but also for use in navigation systems for vehicles. Also, specific vehicle models support these intelligent apps for making the driving experience smooth and providing privacy for the vehicle. It has been observed that Artificial Intelligence app Android has is more than that for IOS. This is because of the fact that the users of these operating systems vary according to the sample population sizes in various places. According to statistics published on Statista, Android operating software sold to its users amounted to an approximate of fifty-one percent in 2011 and an approximate of eighty-eight percent in 2018. Whereas, the IOS sold to its users amounted to an approximate of twenty-four percent in 2011 and an approximate of twelve percent in 2018. All these mobile and web-based software derive the Future of AI Intelligence.